Chicken Fettuccine Alfredo Frozen Meal is on the menu tonight! Would you eat this? Let’s look at this label together. 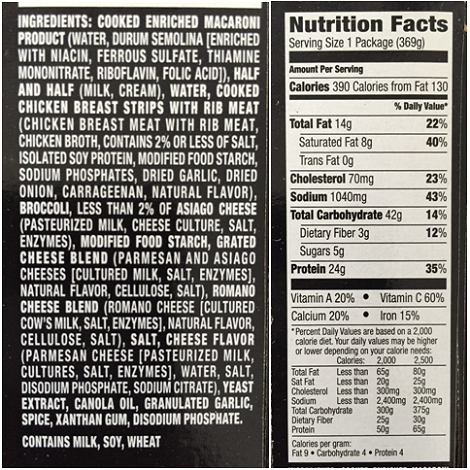 At the grocery store, the packaging may have caught your eye – “24 grams of protein” and “Made with Grilled White Meat Chicken & Broccoli“. While this may be important, remember this is all marketing. The first place to look… the INGREDIENT section. INGREDIENTS. What do you see? Over 50 ingredients. I lost count a few times. Typically, when I see this many, I immediately put it back. Enriched macaroni – this is a white flour product, not a whole grain. You can tell from the word “enriched”. Vitamins such as niacin, ferrous sulfate (iron), thiamin mononitrate, riboflavin, folic acid have been added back to the flour. The sad thing is that the manufacturer of the flour didn’t add all the vitamins and minerals that were removed during the making of this flour, only a select few. Added to the insult is that what they did add back in are synthetic vitamins and inorganic mineral salt. Salt – listed several times. How many times did you see salt listed? (Answer is posted at the bottom of blog.) According to the American Heart Association, 75% of the salt we eat comes from sodium added to processed foods and restaurant foods. Click here to learn more about limiting your salt intake: Why Should I Limit Sodium. Now that you know what this meal is made of, let’s look at the Nutrition Facts box. This section gives you the various breakdown of calories, fats, carbs, etc. I will highlight a few red flags. Always look at the Serving Size. This package states “1”. If you are reading a package that states “2”, you will need to double all the information. Calories: 390 / Calories from Fat: 130 – Divide 130 by 390 and you will find that fat makes up 33% of the calories in this meal. 40% of which is Saturated Fat. If you are trying to keep a healthy weight and a healthy heart. This meal is not going to help. Sodium 1040 mg – The American Heart Association recommends 1500 mg. With this one meal, you would reach 69% of this recommendation. On the Nutrition Facts, you will see 43% listed. This is based on 2400 mg of sodium for a 2000 calorie diet. Because most Americans are eating excessive amounts of sodium, on the label they generously list 2400 mg. This is still way above the ideal recommendation of 1500 mg.
Sidenote: Also to consider when purchasing items for your meals is the nutritional value it gives. Very basic recommendations for your daily intake of fruits and vegetables is 5 servings. Not sure how many pieces of broccoli are in this meal. If I had to guess… not many. So, would you eat this? Comment below! This Reading Labels blog category is A Practice in Reading Labels. Use this blog to build your skills in reading labels when you are out shopping at any grocery story. Don’t trust that just because you are in a “Health Store” that the products are all good for you. Learn to read labels and choose the best products for your family. If you found this blog to be useful, please share it. Salt is listed 9 times.